I do not know about you but I am getting heartily sick of the stewards ruining perfectly good races. The cry is for some consistency in their decisions but this misses the obvious point, so clearly demonstrated by Bourdais' penalty for Massa driving into him in the Fuji GP. There is consistency but only in this: the FIA are determined to penalize anyone who gets in the way of Ferrari winning their worthless championship yet again. How else can one explain the series of ludicrous penalties handed out this season to keep Ferrari in the hunt? The bias is so blatant that they do not even attempt to justify it anymore. I will not argue over Bourdais' penalty - the incident was so clearly Massa's fault that it is not worth debating. Instead, I want to look at the first corner incident since there is so much utter nonsense being bandied about regarding Hamilton's admitted error. Certainly, it was an error, an instance of leaving his braking too late, but to say that he forced Raikkonen off the track (for which, apparently, the penalty was given) is to ignore the video evidence available on Keith Collantine's F1 Fanatic blog. As I did for the controversial Bus Stop incident at Spa between Hamilton and Raikkonen, I have taken screen shots at relevant points from the video. Hopefully this will cut down on silly arguments about who was ahead at what stage and at what point contact, if any, was made. 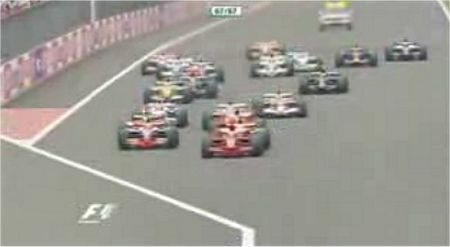 Immediately after the start, Raikkonen has taken the lead with Hamilton tucked in behind him. Kovalainen is to their right (our left), having made a start as good as Kimi's. No argument so far, I think. A little further on and Raikkonen is moving to the outside, just as he did in Spa when Hamilton took the lead. Lewis pops out from behind him, forcing Kovalainen to move right as well; there was no danger of them touching, however, and Heikki has plenty of room. Interestingly, Hamilton is now going faster than Raikkonen, perhaps having picked up enough of a tow while tucked in behind. They enter the braking zone wheel to wheel, except that Hamilton is now going considerably faster than Kimi. It is at this point that contact may have occurred, if there was any - from here on they are too far apart to touch each other. On the video, there does appear to be a slight bang of wheel to wheel, no more than we are accustomed to seeing in such close racing. It is certainly not enough to "force Kimi off the track" at any rate, even if we decide arbitrarily that Hamilton was at fault. Hamilton has misjudged his braking distance and speed and he enters the corner with tires smoking as he tries to slow sufficiently. Raikkonen is now slightly behind and, since Lewis has the inside line, he has no option but to go for the wide line through the corner. Unlike Massa, he knows that, when a car is inside you for the corner, you cannot just turn into it and have it magically disappear. Hamilton has been unable to brake sufficiently for the corner and is now heading for the run off area. Ideally, Kimi would like to turn in now to zip past Lewis while the Brit goes farming; but there is the small problem of Kovalainen following immediately behind Hamilton and he now forces Kimi to the outside of the track. Lewis is in no position to force anyone anywhere - he is ahead but about to sample the run off area. Kovalainen has also outbraked himself and is on a course for the run off. There may have been contact between him and Kimi at this point but only here can Kimi claim to have been forced off the track. Had cars not been inside him, he would have been able to turn in - but that is true of almost every overtaking maneuver in F1. Give up the inside line and, in nine cases out of ten, you have lost the corner. We know all the arguments about first corner incidents not being penalized because they are inevitable with so many cars trying to grab an advantage at the start. That is far too flimsy a point for the FIA to consider, however. Precedent counts for nothing in their world, as so ably shown at McLaren's appeal against the Spa penalty. But the video shows that it was not Hamilton who forced Raikkonen off the circuit; he was too far ahead by that stage to have any influence on the Finn's line through the corner. It was Kovalainen who prevented Kimi from taking the outside line and, if a penalty had to be doled out at all, Heikki should have been the recipient. My conclusion has to be that the stewards picked on Hamilton because he is the one endangering a Ferrari championship this year. One must presume that they have the video evidence and used it to come to their decision; but I must also presume that they were not interested in Kovalainen's role in the incident. The agenda was to find a way to handicap Hamilton. At Monza, it was reported that all the drivers felt that Hamilton's penalty at Spa was fair, if a bit harsh. Now that Bourdais has been so unjustly penalized for daring to race with a Ferrari, perhaps they might think again and wonder when their turn will come. Not that it matters, of course. It has long been apparent that this year's championship is little more than a farce. For the sake of debate Clive, I would contest that where you have followed the image with "They enter the braking zone...", the braking zone actually started in the screen capture one above (but not for Hamilton, hence his problem). This would, for me, mean that Hamilton actually began the 'corner' behind Kimi. I also think that you have missed a critical screenshot; one of the exit of the corner (0:12 seconds in on the video on Ollie's blog), where you can see Hamilton recovering (by now in front of Kimi) from off the track. In light of the reasoning for his penalty at Spa - gaining an advantage from outside the confines of the track - can a case be made for saying that the Stewards have applied the penalty consistently? Like I say, the above is for the sake of debate. In truth I am with you and the precedents simply do not exist for the Stewards to apply that penalty. 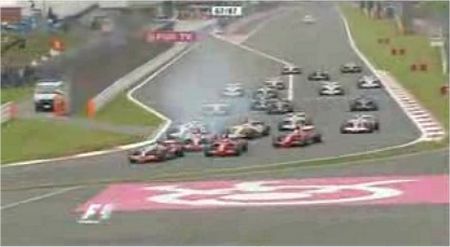 Of the Massa penalty: A few years ago that may have been a racing incident. In today's climate of penalties for next-to-nothing, they had little option. Too many wheels, too far off the track for me. Debate it is then, Punter! I did not mean the braking zone to be quite as precisely defined as may appear. It will vary from one car and driver to another to some extent anyway. But I will say that, if Raikkonen began braking as early as you suggest, that Ferrari must be pretty poor on cold tyres. Hamilton did brake late (if you watch the video again, it is almost as if he saw his chance, dodged out from behind Kimi and found that he was closer to the corner than he had expected - it all happened that quickly) but he nearly made the corner. Had he been just a little quicker on the brakes, he would have avoided the run off and been gone while Heikki and Kimi sorted out their own problems. The stewards have effectively shot themselves in the foot with the Spa penalty for Hamilton and subsequent "clarifications". Now that they have called attention to what was a perfectly normal F1 event and deemed it illegal, they have to judge every excursion off the track. They should also define exactly what constitutes going off the track - except that they won't because they want the freedom to apply penalties when they want to and not according to a rulebook. As it stands, it seems it's fine to use the run off areas to gain an advantage but do not cut a chicane (whatever that means) at any price. Their interpretations are entirely decided on the day and according to where drivers finish the race so I wouldn't count on the run off area being okay for long, especially if you're racing against a Ferrari. Apparently, the penalty was given for forcing another car off the track and had nothing to do with Lewis' use of the run off area. I suppose in their haste to penalize Hamilton, it never occurred to the stewards that they could extend the Spa ruling to include run off areas. 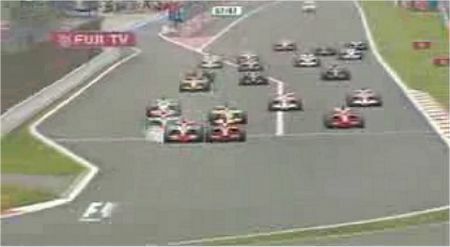 It does indeed seem that Kovalainen was just as responsible for Raikkonen missing the corner as Hamilton watch. If you see the reverse-angle video from the inside of turn one (also on my site) it's a bit clearer. I haven't seen any onboard yet but, for this and Bourdais', they would be very illuminating. I suppose in their haste to penalize Hamilton, it never occurred to the stewards that they could extend the Spa ruling to include run off areas. I'm not too sure about how close Hamilton was to making the corner then scampering off, his tyres were so badly flat-spotted that he replaced them after two laps. Moot point I guess. More concerning for him I would have thought, is that after a slow getaway, the next few seconds/minutes were the biggest test of Hamilton’s bottle since the climax to last season. Interesting trait. Keith: I've searched your site but can't find the reverse-angle video - where have you hidden it? Punter: If the tyres were as badly flat-spotted as you say, why didn't Lewis come in at the end of lap 1 to change them? I think he came in on lap 2 because the car was handling strangely after Massa attacked him and he needed to find out if there was serious damage somewhere. They change the tyres as a matter of course at any pit stop, even when the car is retiring. Ted Kravtiz (I know...) on ITV reported that at the pit stop the tyres were so badly flat spotted that canvas was showing. If that is true then it makes his decision to attack Massa even more questionable. Keith: Never mind, I found it (cleverly hidden at a later stage of the main video). I think it illustrates just as clearly that Kimi was ready to take the outside line as Lewis headed off the track but was prevented from doing so by Heikki. What this later part of the video does show is the strange case of DC - the rear suspension appears to break for no apparent reason, causing him to veer off the track, collecting Nakajima's nose as he does so. At least I can prove now that Kazuki was taken out through no fault of his own! Punter: Ah well, who am I to argue with Ted Kravitz? But as for attacking Massa, I would point out that Lewis was in a position to do so and could hardly have been slower than him in that case. Not bad for a guy on tyres so badly flat-spotted that the canvas showed through. And, when a guy overshoots his braking point for the chicane and leaves the door wide open, anyone behind is going to accept the offer. In fact, so wide was the door that Lewis could hardly have done anything else, apart from repeating Massa's mistake. I agree with your synopsis completely Clive. That said I think Hamilton still has a few years of growing up to do. His race was/is with Massa, for the title. To try and win it all in the first corner in this manner is plain stupid. Why risk a seven point lead over your rival by trying to win the race in the first corner, specially considering the other cars as your rival's team mate and a Ferrari? If Kimi was a true company man he could've knocked him out right there and it would have looked like a racing accident. He knows as well as anyone the cards stacked against him. To play into the hands of the stewards (Mosley and Ecclestone's pawns) is ridiculous. Poor Hamilton may excel at car control and have the biggest cojonés but he has a whole lot to learn about strategy. Kudos to Kimi. It was interesting, watching Alonso's face when the interviewer mentioned the good job Piquet did. He didn't seem happy, sharing the tiniest bit of limelight with his parter. I must say, it was a marvellous drive he put in though. Amazing also is the effect of all the manipulation by those in power. It is hard to say if Renault is the real thing, or just extremely good at scavenging. I can't feel nothing but annoyed about your article, Clive. I believe Hamilton penalty was unfair, specially if we realize it was the first turn. Ok. That's a common point. No doubt about it. But another story is to take some static pictures and try to explain something with them that can only be seen in full motion. Hamilton lost the break point by miles. Watching the videos you can see him passing like a rocket between all of them, after he pushed aside Kovalainen in a full risky way. This point of view is a nonsense IMHO. You could take a more constructive approach, like the huge lessons Lewis needs to learn to be a worthy world champion, because he can win this one but most of us won't feel he is one of that class yet. You can read some of the headlights around, and what they say is that Lewis cracked under pressure, that he made an error and payed the race for it, that the error is his exclusively.... I've read The Guardian, The Times, the International Herald Tribune, the BBC and that is what I understood. Not to add the blogger community nor foreign press like Gazzetta or the spanish press. Instead of that you defend that it was Hami's racer spirit what makes him act like a moron... and we must admire it for that. I expect anxiously you raise the level next time. I have been saying all season that Alonso is doing a tremendous job with less than perfect machinery. Now that the car is coming good, I think he is reaping the benefit of his hard work and thoroughly deserves it. What a load of crap! It is abuntantly clear to me that both Lewis & SeaBass got the royal shaft. The first corner incident was simply racing. Massa was clearly in the wrong when he spun Lewis...and so completly in the wrong in the SeaBass incident that I'm at a total loss on how the stewards could have possibly put the blame on him. After what's happened throughout the season I thought the stewards didn't dare make any more Ferrari-centric decisions. Boy was I wrong. I am sick and tired of this crap and my enthusiasum for F1 has reached an all-time low. Architrion: I use the stills from the video because so many watch it and still say silly things like "Hamilton pushed Kimi off" when it is quite clear that he did not. Since people seem unable to see the truth from a video, I take stills at important moments to illustrate what I'm saying - they are not supposed to be a substitute for the video but act merely as reminders. Yes, Hamilton missed his braking point, but only just - as I said earlier, he nearly made the corner. As for his coolness under pressure, I am going to write about that in the next day or so (something for you to look forward to!) and you might find that you agree with some of what I say. Don: What can I say? I, too, have nearly seen enough to make me give up on F1 completely. It is still a tremendous sport but how long this can continue with such crass rulings from its officials, I do not know. Is it just coincidence that there seem to be controversial stewarding decisions at every GP these days? Oh, of course, it's getting near the end of the season, isn't it? Hey, don't take it so badly from me. I didn't pretend to sound irrespectful or something like that. I intended to say that we all know that penalty is fully undeserved. First thing that came to my mind when Massa made Hamilton spin off was that stewards had no other scape than a walkthrough for Felipe and, therefore, they needed something similar to apply to Lewis. That's true. But what's the point about it? It was the last link of a chain of errors. If we are going to have a fiery battle I'd preferr to have it for the first link of the chain. Easy, don't you think? Clive, I agree with you. And I was waiting for your opinion on the matter. Thank for the insight. How ironic that F1 competes directly against Coronation Street's weekly reruns on Sunday morning. Last night, for a change, it was playing at the same time as ice hockey. 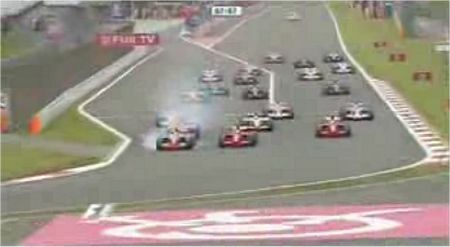 Sometimes the refereeing decisions aren't great in hockey but they wouldn't dare do what is found acceptable in F1. After all, there are six full sized men with hardwood and metal sticks close by.... which makes one think of a good way to get the stewards back in line. So I guess that's 8 "charity points" so far for Massa? Architrion: Oh, I didn't take your comment badly at all - in fact, I was quite pleased that someone was commenting from another point of view. Green Flag does occasionally (and very well) but he's a little bit outnumbered usually! Moe: Thank you - always good to know one's work is appreciated! Nick: Ah, ice hockey - the sport invented so that large Canadians can beat the crap out of each other. It's a bit like heavyweight boxing really, where you have a tiny referee trying to separate two giants determined to grapple! I can't believe the farce of this race! Hamilton was stupid and hot headed and should have allowed kimi to lead and then look to take him on another corner. However I have seen this in many races by many drivers and I have NEVER seen a penalty given when there has been no collision! Maybe he deserved a penalty but then this again points to inconsistances as there were other cars behind him which also went in to hot and collided with others, yet these received no penalty! Massa then gets reckless and takes out hamilton. In doing this he committs 2 different offences, 1) recklessly crashing into hamilton and 2) leaving the track and gaining an advantage! For this he receives 1 penalty which is the same as the penalty issued to hamilton.... Also hamilton also suffered the most out of the collision as he was left at the back of the field and with a damaged car to boot! Massa then recklessly crashes into bourdais and not only do the stewards leave the decision until after the race with 15 laps to go (which is against the rules) but then somehow manage to lay the blame on Bourdais! I am sorry but I can't see what bourdais was supposed to have done, he had nowhere to go. Then he gets a 25 second penalty giving massa another point!!!!!!!! Then Massa overtakes Webber by dangerously leaving the circuit (imagine if someone had been coming out of that pitlane at the time, they could have been killed!). Massa could also arguably gone around the other side of webber or left it until the next corner (as webber had very little grip). This incident is then not even deemed worthy of investigation! Wow, I was really upset that I missed this race but judging from what I've seen here and around the net I think it best that I missed it. Another nail in this F1 coffin and one more step back to WRC for me. Seriously, when I heard of Lewis going in too hot with Kimi, I was and still am upset that he could do something so crazy in the first corner. Yet like you Clive, there is something about it that I can appreciate if the door is left open and I always remember Senna saying to Jackie Stewart that "if there is a gap and you don't go for it You're not racing" (well something like that). Some may disagree but I watch racing for racers not parade drivers and yes some racers will never win championships because of this attitude. Hopefully someone at McLaren will find a way to tame this attitude in Lewis for the times when he needs to remember a championship. Cant comment about the penalties because I haven't seen the videos but what I must say is that after reading various news sites I was under the opinion that Bourdais had done nothing wrong and they felt Massa was in trouble. Then I visit a blog and learn that they have found a way to penalise Bourdais on the day of his best finish and find another point for Massa. I hate conspiracy 'theories' and that is why i agree with you Clive because this is looking like a conspiracy FACT! I've just watched the video of Lewis and Kimi and I really don't think I am being biased when I say that I dont think Lewis forced Kimi off. Raikkonen takes evasive action but appears to be still on the track and it seems to me that Kovi is the one who sticks it to him on the edge of the track when he didn't need to. But hey, I am one of the stupid people Mr. Whippy referred to after Spa. Now I watch more rallying that circuits so forgive me when I ask if we would see that penalised in many other racing series? I've seen similar first corner action and the crowd just loves the jostling and the drivers get on with it. I am hoping that both Massa and Lewis keep there heads on and lets have a good finish for this title. Corey: As you point out, the first corner action at Fuji was no more than we see at many GPs. But suddenly the stewards take it upon themselves to intervene with an extremely dubious penalty aimed at one of the championship contenders. It takes no stretch of the imagination to see that the likely cause of this was the fact that they could not avoid penalizing a Ferrari driver and so had to even the score somehow - the investigation into the first corner incident was announced at the same time as the one into the Massa/Hamilton collision. No doubt Hamilton and McLaren are becoming used to their efforts being negated by the FIA, but one has to feel for Bourdais, who puts on his best performance of the season only to see it reduced to nothing by some stupid driving by Massa and a few bent stewards. It makes a mockery of racing. Just finished watching the race and I'm staggered to hear they've penalised Bourdais. If he'd gone anymore on the inside he would of been on the grass or the wall. Staggering, Massa's error gives him an advantadge. So now there`s penaltys for outbraking yourself and not jumping out the way of a Ferrari driven by Bam Bam, Iam not even gonna raise the FIA and Ferrari bias because that has been obvious for months, if not years, but if I was a Ferrari supporter I would be not be celabrating when they gift the WDC to Bam Bam at the end of the season, how you can wear the Ferrari badge with pride is beyond me, I feel disgusted with the ex-sport we refer to as F1, and to wear the badge of the Ferrari would make me feel dirty. perhaps the economy collapsing is a good thing for the sport, as to put it out of its and my misery. the only reason I will watch F1 is for the crashes, as for buying anymore F1 magazines or memrobelia, them days are over, as we speak Iam preparing to sell it, the thought of anymore of my money going into the Poisen Dwarf`s pocket makes me want to vomit. It's all there in Article 17 (b) subsection C, Pootle: Drivers impeding or in any way failing to get out of the way of a Ferrari driver will be penalised in terms of whatever time penalty happens to be the flavour of the month. There is no appeal to this rule. I know exactly how you feel, Gusto - it sickens me too. In fact, you have just explained to me why Bernie, Max and their henchmen take absolutely no notice of the internet. It is the last place on earth you can find things for free and they haven't worked out how to pick our pockets online yet. I have read Massa's comments on the incidents, Gusto, and they are pure fantasy. People criticize Hamilton for his supposed arrogance but nothing beats Massa for having a one-sided view of everything. Come to think of it, that may explain the Bourdais incident - Sebastien was on Massa's blind side! 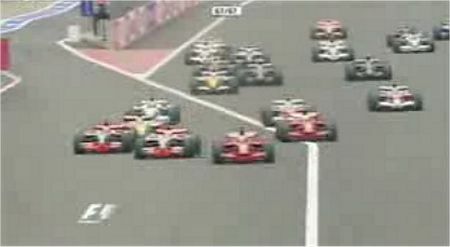 Looks like I am alone in believing Lewis was right to try and take the lead at the first corner. OK he made a complete mess of it but given how slow the Ferrari is on cold tyres it makes sense to try and make an early break and stay away from trouble rather than give Kimi the option of backing him into Massa. To be fair I think Kimi has too much class to do that unfairly unlike some previous Ferrari drivers. Irvine at Suzuka for example. Had Lewis not screwed up the first corner and lead away from it there is every chance Kovi would have been able to jump Kimi on the first lap as well given that we know how slow Kimi is in his early laps. Had that happened no-one would have criticised the move. He tried a pass and made a mess of it. It happens. Coulthard said he had contact with two cars in the first corner that was enough to cause a suspension breakage and potentially a serious accident. If you are a stewar do you investigate an incident with potentially serious results or some driver braking too late? Bourdais had his right front wheel on the kerb just before contact. Is he not allowed on the race track. Massa caused two accidents and is given an extra point as his penalty. Given that point plus the 6 he gained at Valencia by his non-penalty and the 4 he gained at Spa through Lewis's penalty for not parking while Kimi decided to make an attempt at the first corner the stewards have done a better job than Massa of getting a driver's championship for Ferrari. You have to wonder with all those points and the fact that the Ferrari is a better car than the McLaren what it will take for Massa to win the championship? One thing I meant to ask. Why is it that incidents involving Massa get investigated after the race. 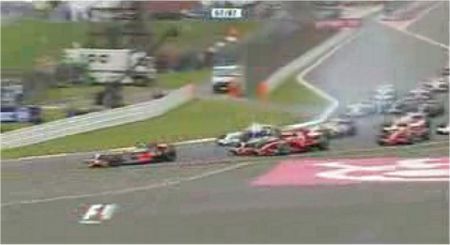 The collision with Bourdais happened with 13 laps to go. There was absolutely no reason for not investigaing it at the time. Unless of course like at Valencia the stewards wanted to understand the effect of a penalty on the final result before deciding on the penalty or yet again non-penalty. You are not alone, Steven - I agree with you. The only thing I would point out is that DC's problems in the first corner did not involve a Ferrari driver. He is on his own, therefore, and completely free of interference from the stewards. I too was absolutely disgusted by the intervention of stewards once again. The first corner incident didn't seem any different to dozens of race starts, and don't forget that this was the first proper start in the dry at Fuji in it's modern form -- it seemed like lots of people went in a touch too fast, yet only one gets a penalty. The only sensible penalty was the one on Massa for punting Hamilton when it seemed totally avoidable, and like others I did find it very strange at the time why an incident similar to those investigated and handled in a timly manner early in the race was postponed until after the race. It's like the FIA really want to rub the fans noses in it by saying "Yes we know you got up early so you can watch the race live... but we'll decide the result when we're ready." It's just a shame that the good racing we've had in the last events have been spoiled by stupid stewards. Will the FIA post any further explanation, or are we stuck with the normal "trust us" rationale? By the way, "trust us" is how they say f**k you in L.A.
Massa`s neck nows no length, not only was him cutting a chincane to poleaxe Lewis "hard but fair", Bouidais was at fault because " I entered the corner and he hit me from behind, spinning me out", the Man is a complete Moron if He expects us to believe that Horse Sh*t, If Massa wins the WDC I would advise Him not to make not to big a song and dance about it, because History will show it for what it is, worthless, and to bring extra big ear plugs to Silverstone next year, because the Boo`s will drown out the engine noise. I agree with you that I don't think there should have been any penalty for the actions in Turn One, otherwise, the entire field would have had to serve. There should be a rule to the letter that says that once you enter the asphalt runoff you must give up at least one position if you are being followed by more closely than one second. Clive, to say that we are viewing some of the "best racing in the last ten years" under the circumstances is like saying the meal was a success because the Yorkshire pudding was good. The fact that the roast beef and vegetables were terrible and left a putrid taste in your mouth is overlook while in reality the meal wasn't worth the price. The racing being good is a side product of desperation. The plot is either WWF or B-western, except the good guys won't win in the end. The only possible just outcome is for the FIA to end up in a court of law for running a fraudulent contest ala "Payola" scandal of the 1950s. What we have is two old, perverse senile men who know they've little time left. They have taken it on themselves to mark F1 now, in a way neither one could as a decent driver. neurotic obsessions are not likely to begin and end with sexual deviancy in hidden basements. Both He and Ecclestone are in another world completely. I know why it takes the stewards such a long time to consider what penalties to apply. It is simply a matter of time, the time it takes to read and understand all the rules, cross-rules, addons, special appendants, and the Call the ferrari headquarters to hear what they have to say. Get their first ruling thrown down the drain, and try to do it all over again about three of four times. Don: Explanation? From the stewards? Surely you jest. Although we might have one of Charlie Whiting's "clarifications" that merely confuse things even further. He could start with "How to be passed by a Ferrari without getting penalized". Gusto: That is the result of all these bad decisions - the championship is becoming so tainted that it means nothing in the end. Who would want to be the champion that goes down in history as the one the FIA helped to the title? Chunter: Thank you. I don't know about adding even more rules, however. If they could just define where the track ends, it would be a step in the right direction. Nick: That's true - the meal was good but the Stewards Sauce leaves an awful aftertaste. I say sack the chefs (if only we could)! Björn: Oops, that comment about the phonecall was supposed to be for you. Sorry about that (and to Dave as well). I must learn not to read all of the comments before answering - I had that in my mind as I started, obviously. I just read where the stewards overuled Charlie Whiting on the SeaBass incident. Gee, I wonder who got to the stewards? Don: I haven't seen that reported anywhere yet - do you have a link? But we know who is running the stewards: Max Mosley through his puppet, Alan Donnelly. As for Charlie Whiting, he is obviously trying to rehabilitate his reputation after having been shown to have fabricated evidence for the McLaren appeal. It's too late for that, as far as I'm concerned.